Looking for A Unique Gift for Her? Thinking of a Unique Gift Idea for Her? Girlfriend, Wife or Mum! Choosing a gift for your special someone can be time consuming, especially if you have no idea what present to get her on her special day. Whether it is for your 50th wedding anniversary or your girlfriend's birthday, a unique and out-of-this-world present for her is essential if you want to make her feel special. Ever thought of getting her a nice abstract painting for her special day though? It's the kind of gift that isn't too materialistic nor too cheap at all. Giving your girlfriend, wife, sister, aunt, or all the most loved women in your life a nice art present will surely make them feel happy and special. This is because finding the right art piece to give as a gift, whether it is a portrait from photo or a piece under contemporary art, can be time consuming and difficult even. You will have to look for a place that sells all kinds of possible art works to give as unique gifts for herand that is where Direct Art Australia comes in. As a leading producer and distributor of quality art works, we offer a variety of works that you can give as a special and romantic gift idea for her. Giving her something unique and out-of-the-ordinary stands out more than the usual anniversary and birthday gifts for women, which is why you will find a lot of choices when searching for the perfect gift to give to your wife, your girlfriend, your mother, sister, and the rest. If you want to give her something totally original, you can give her a special portrait from photo or a rare reproduction of an artwork by her favorite artist. You can also hang a beautiful modern art piece so that she can look at it and always be reminded of you. These artworks are suitable as wall decorations for the dining room, living room, bedrooms, and lounges both for personal and corporate use. But most of all, these paintings are suitable as gifts for your loved ones as they express personality, emotion, and the inner soul in more ways than one. 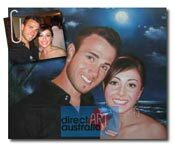 Both art fanatics and ordinary individuals will definitely love the massive collection Direct Art Australia has to offer, so visit our galleries and don't hesitate to pick a painting or two as a unique gift for the special women in your life. Take note that we offer free shipping to customers from all areas in Australia, including Melbourne, Sydney, Brisbane, Perth, and Adelaide.